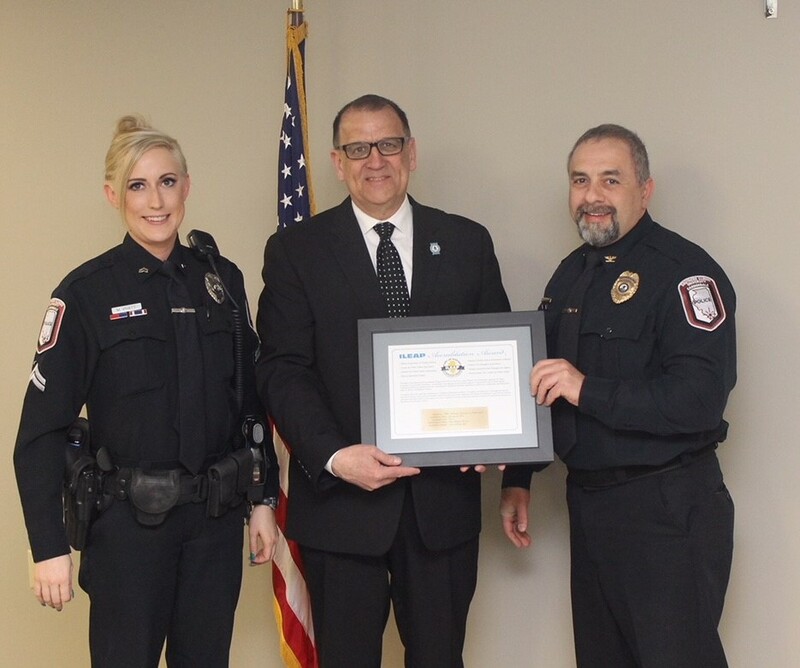 The Lockport Police Department was recognized April 3, 2019, for achieving ILEAP Accreditation (Illinois Law Enforcement Accreditation Program). ILACP Vice President Bill Kushner (right) made the presentation to Lockport Chief Terry Lemming, left, Deputy Chief Ron Huff, and Mayor Steve Streit. 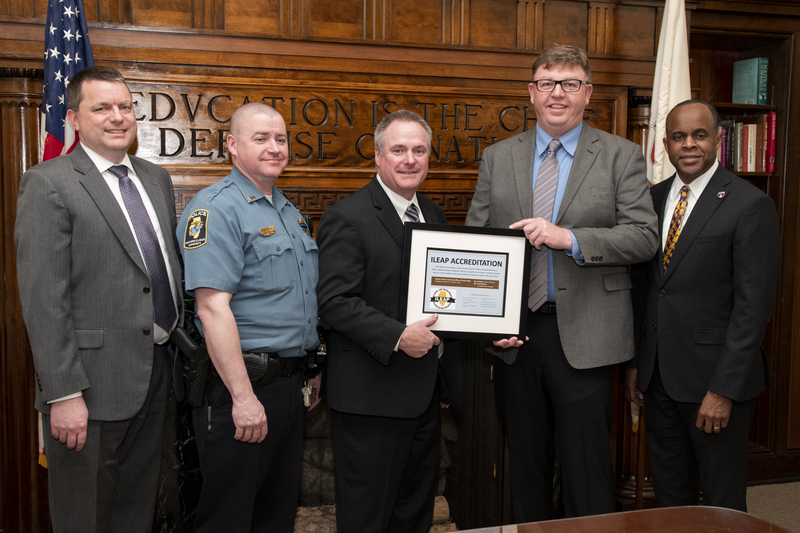 The Office for Public Safety at Western Illinois University was recognized April 2, 2019, by ILACP President Brian Fengel (center) for achieving ILEAP Accreditation (Illinois Law Enforcement Accreditation Program). From left are Bill Polley, WIU Interim VP for Administrative Services; Derek Watts, OPS Interim Director; Fengel; Sgt. Curt Bilbrey, accreditation manager; and Jack Thomas, president of WIU. 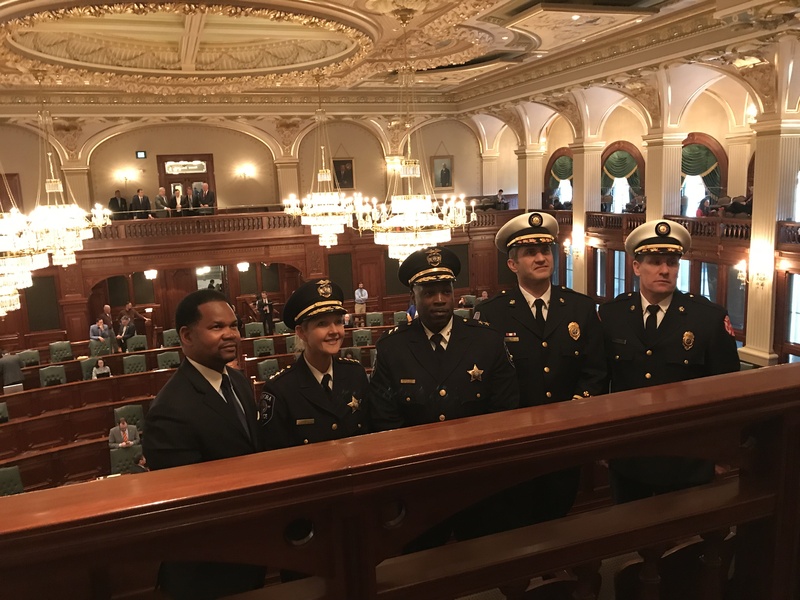 Aurora Police Chief Kristen Ziman and other first responder personnel were recognized by the Illinois House of Representatives on Wednesday, March 13. On Feb. 15, a disgruntled employee fatally shot five people and wounded five officers at the Henry Pratt Co. warehouse in Aurora. Police were called to the scene just before 1:30 p.m. Friday. Within five minutes, Martin had shot the five officers who arrived at the warehouse. The shooter hid within the 29,000-square-foot warehouse and continued to fire at law enforcement personnel. Rep. Wheeler (R-Oswego) gave an impassioned floor speech honoring all first responders involved for their courage and hard work during the traumatic event. 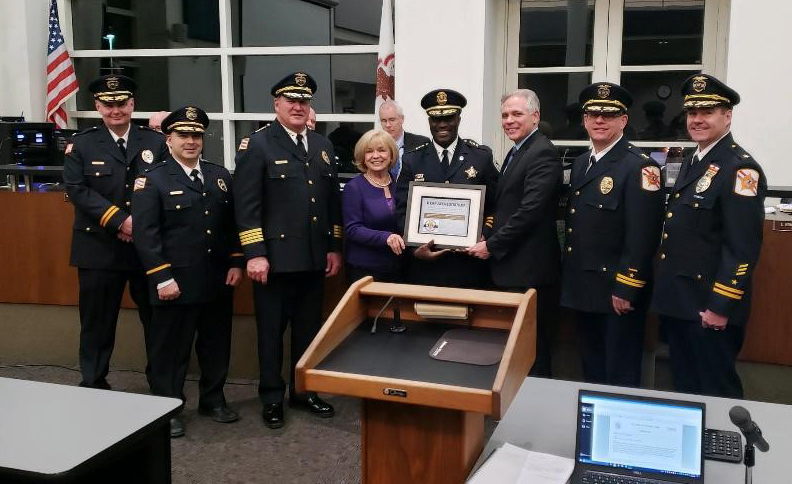 The Orland Park Police Department was recognized this week by ILACP VP Chief Mitchell R. Davis, III (Middle) with its ILEAP reaccreditation plaque. There are 31 ILEAP-accredited agencies, and another two dozen agencies are looking into this increasingly popular program. 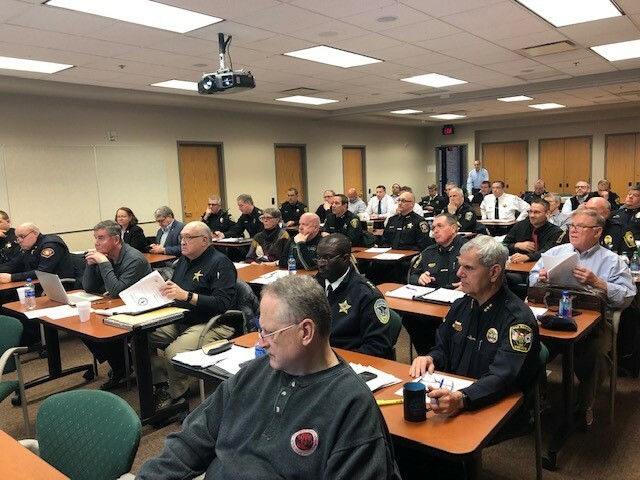 The Legislative Committee met on February 15 at the Oak Brook Police Department. An additional group of committee members met at a second site at the O'Fallon Police Department where a virtual meeting was set up. Chief Marc Maton of the Lemont Police Department led the discussion by introducing the ILACP top priorities for 2019 and this year's Public Official(s) of the Year. We will send a Legislative Update with details about these priorities in the next few days. 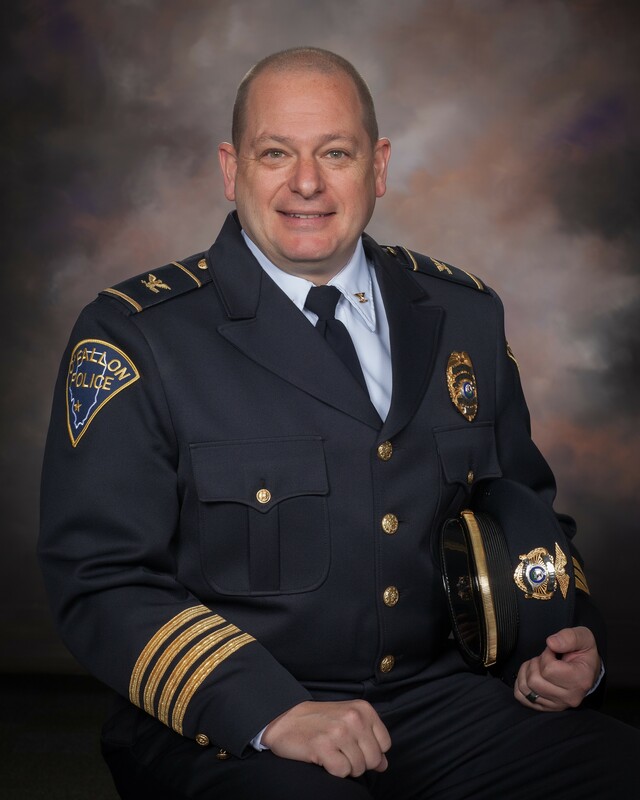 O’Fallon Police Chief Eric Van Hook has been named the 2019 Chief of the Year by the Illinois Association of Chiefs of Police. The award is for leadership in his community, leadership in his own police department, and service to the association. ILACP is a 1,300-member organization representing more than 450 agencies in Illinois. 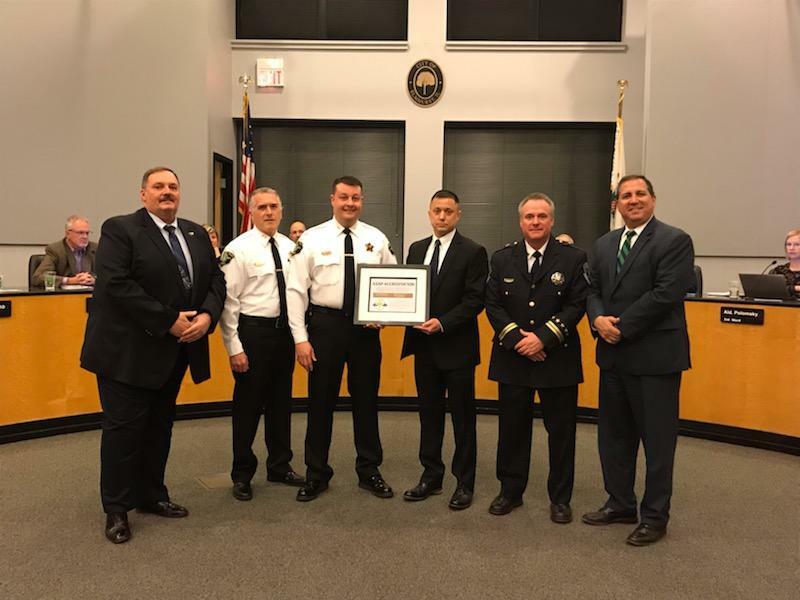 The Elmhurst Police Department was recognized this week by ILACP President Brian Fengel (second from right) with its ILEAP Accreditation plaque. Elmhurst Chief Michael Ruth is at left. There are now 30 ILEAP-accredited agencies, and another two dozen agencies are looking into this increasingly popular program. 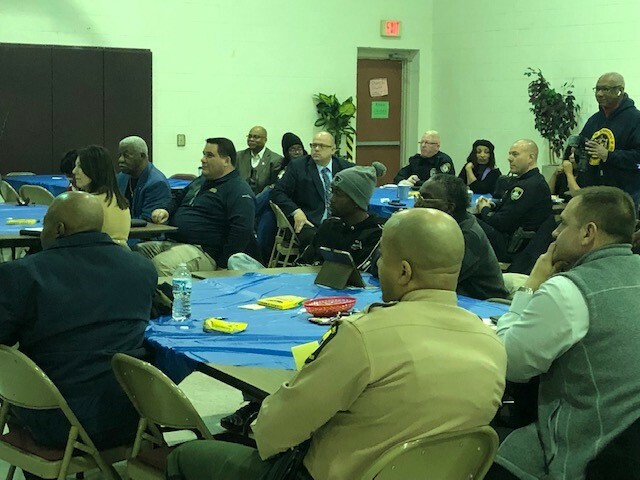 Yesterday, the Illinois Association of Chiefs of Police and the NAACP succeeded in bringing together 42 law enforcement leaders and NAACP/minority group leaders in Springfield, IL. It is important to note that the World Cafes are designed to bring people together to build trust and relationships. The participants did indeed build trust with each other in the course of the conversations, and concluded that they wanted to bring younger people to the table. The organizers will be heading to Galesburg, IL this afternoon to continue the World Cafe series. Shop With A Cop of Dundee Township held their annual event on Saturday December 8th. Shop with a Cop (SWAC) served 125 children from 55 families on Saturday. Each child was given $100 to spend, along with a new winter coat. Each family was given a gift certificate from Village Fresh Market (Carpentersville grocery store) to help with purchasing a holiday meal. Community volunteers, as well as Police Officers from the following departments made this event possible: Carpentersville, East Dundee, West Dundee, Gilberts, Pingree Grove, Sleepy Hollow, Maple Park, Roundlake and the Illinois State Police. Carpentersville Walmart Supercenter hosted the event. 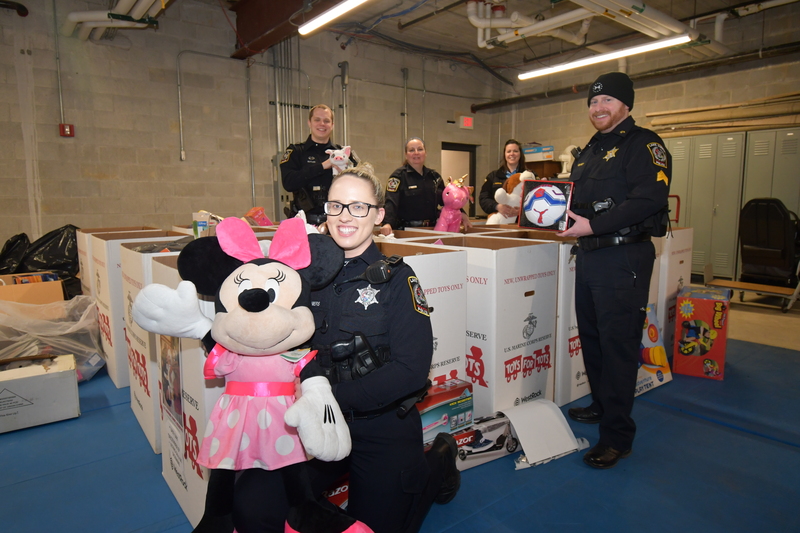 The Lake Zurich Police Department again participated in the Marine Corps Toys for Tots program this holiday season. The department had a very successful year thanks to the generous donations from the Lake Zurich community. The toy donations will bring much happiness to many children in the area. 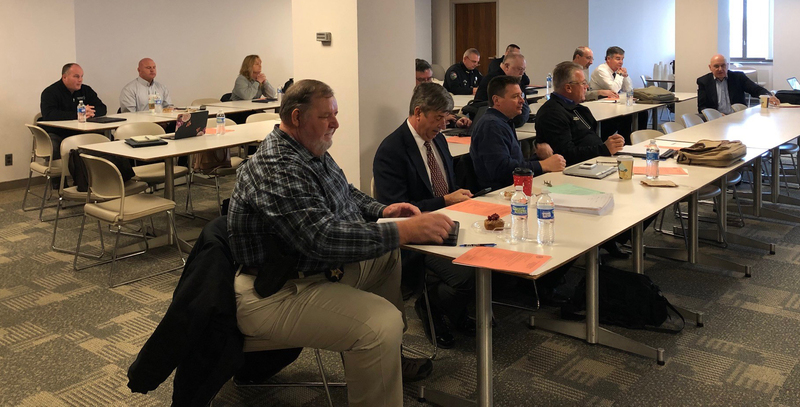 The ILACP Board of Officers and Executive Board met yesterday at the Illinois State Police Headquarters in Springfield and adopted a resolution endorsing the FBI's new national use-of-force new data collection, set to begin January 1. The data collection pilot study began in 2017. The International Association of Chiefs of Police was heavily involved in the development of this process. The Illinois Association of Chiefs of Police has also provided statewide and national leadership on the topic of use of force. In adopting the resolution, the association encourages all agencies to participate in this FBI data collection effort. 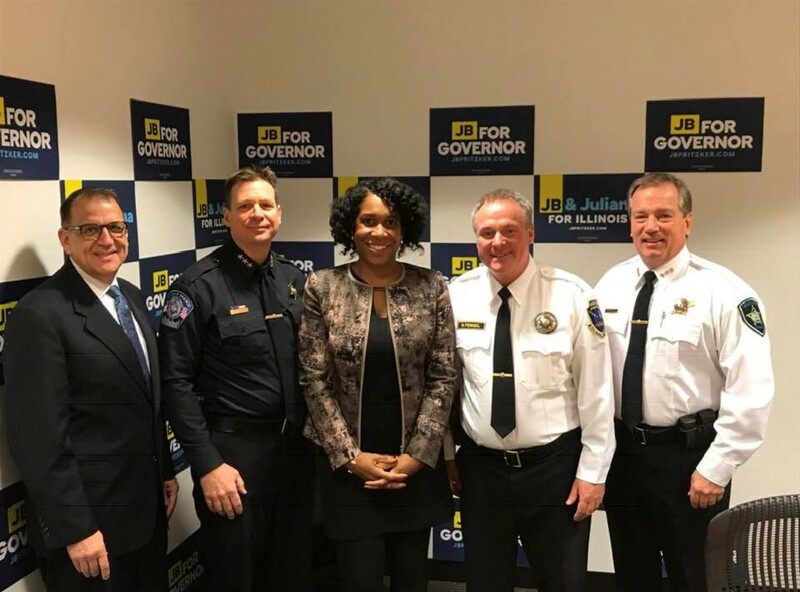 On December 7, three of our leaders and the ILACP Executive Director met with Lt. Gov-Elect Juliana Stratton to talk about criminal justice issues. A good conversation! Lemont Chief Marc Maton is next to ILACP Executive Director Ed Wojcicki, with ILACP President Brian Fengel of Bartonville and 1st VP Steven Stelter of Westchester. 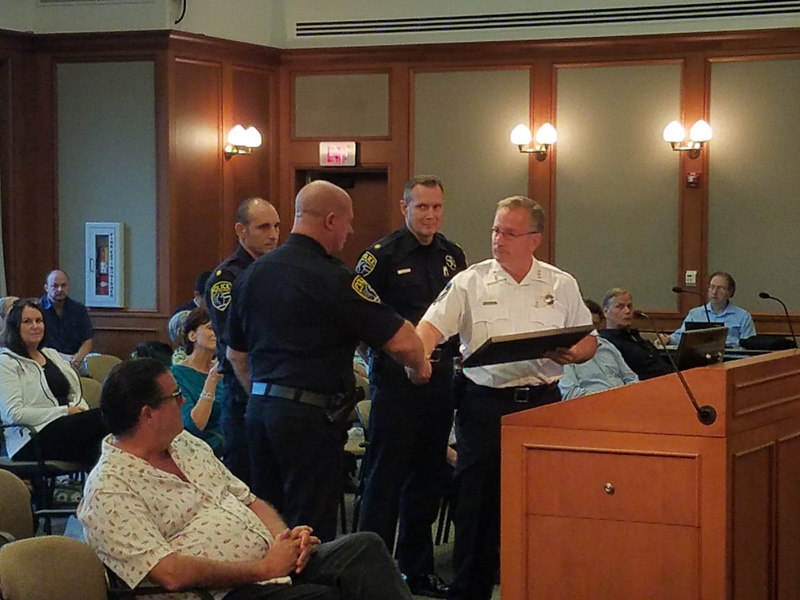 The O’Fallon Police Department was recognized at the city council meeting Monday night for achieving ILEAP accreditation. 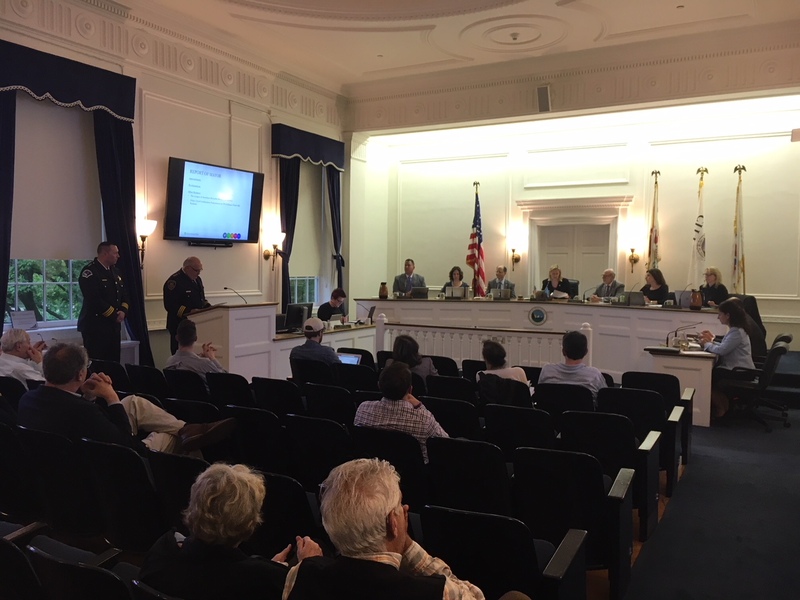 From left are Lt. Kerry Andrews, Lt. David Matevey, Captain Jim Cavins (accreditation manager), Chief Eric Van Hook, ILACP Vice President Dan Ryan (who made the presentation), Leah Wilson, and Mayor Herb Roach. In front is Ryan Lotz, who was the mayor for the day. 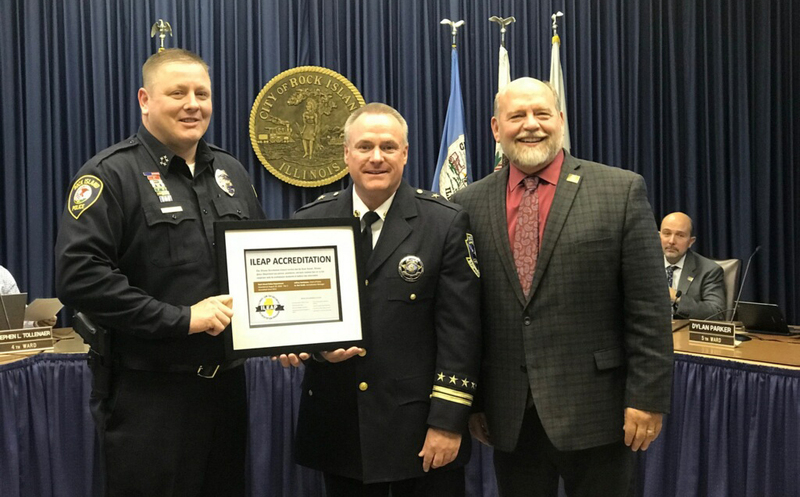 Rock Island PD Police Chief Jeff Van Huizen (left) and Mayor Mike Thoms (right) enjoy the accolades from ILACP President Brian Fengel on Monday, November 12, when the Rock Island PD was publicly recognized for being reaccredited in the Illinois Law Enforcement Accreditation Program (ILEAP). 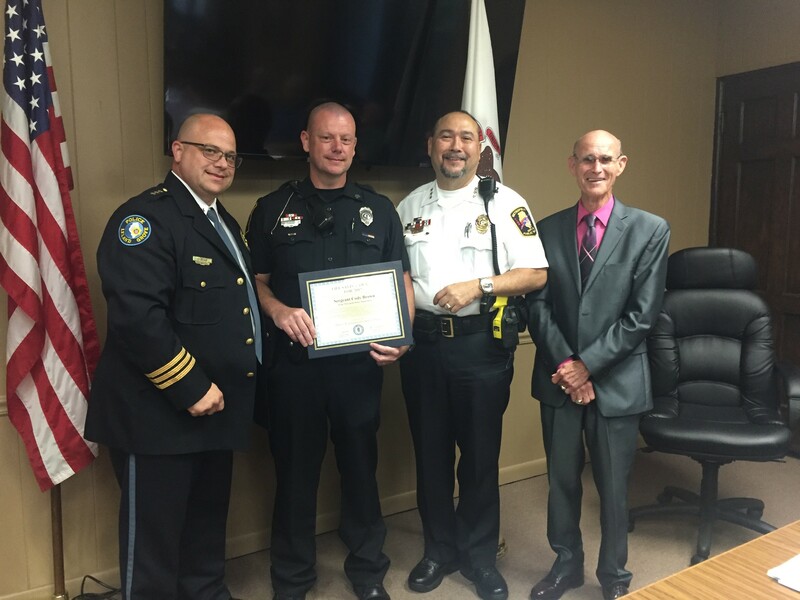 Commander Michael Zochert of the Carol Stream Police Department (left) was recognized Monday, October 15, by ILACP Vice President Dean Stiegemeier for successfully completing the Police Chief Certification process and receiving his certificate as a Certified Eligible Police Chief. On August 5, 2017, officers responded to a call of a woman obstructing traffic while swinging a deadly weapon and screaming, “I will not be moved”. Despite numerous commands, the woman refused to comply, forcing officers to deploy tasers. The initial action resulted in little or no effect, and the woman continued to display erratic behavior. After managing the high-risk situation, officers were finally able to detain her. Each officer involved displayed extraordinary professionalism and heroism in an extremely dangerous event. 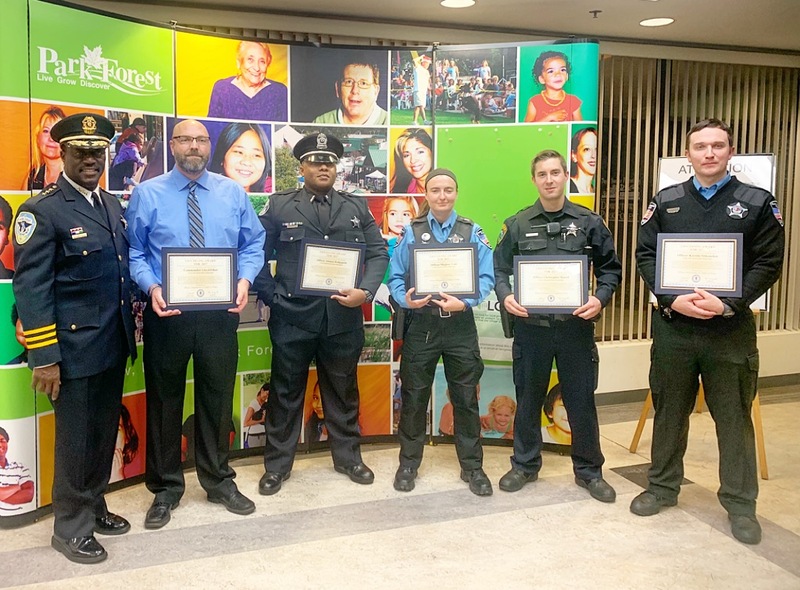 Vice President Chief Mitchell R. Davis, III presented six Medal of Valor awards to following: Commander Lee Elliot (PFPD), Richton Park Police Officer Alonzo Hedgepeth, Officer Meghan Vold (PFPD), Officer Christopher Batzel (now with Countryside PD), Officer Karolis Sitkauskas (PFPD). Not pictured is recipient Officer Tom Naughton (PFPD). 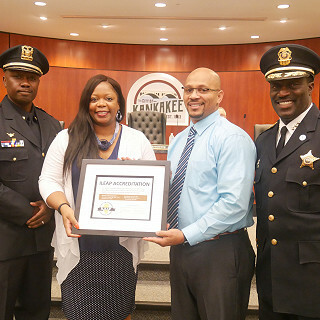 The Kankakee Police Department was also recognized on Monday, October 1. ILACP Vice President Mitchell R. Davis III (right) presented the ILEAP reaccreditation award. Representing the police department at the ceremony were acting Chief Willie Hunt (middle). Also pictured are Chasity Wells-Armstrong mayor of Kankakee (middle). A list of all ILEAP-accredited agencies is here. 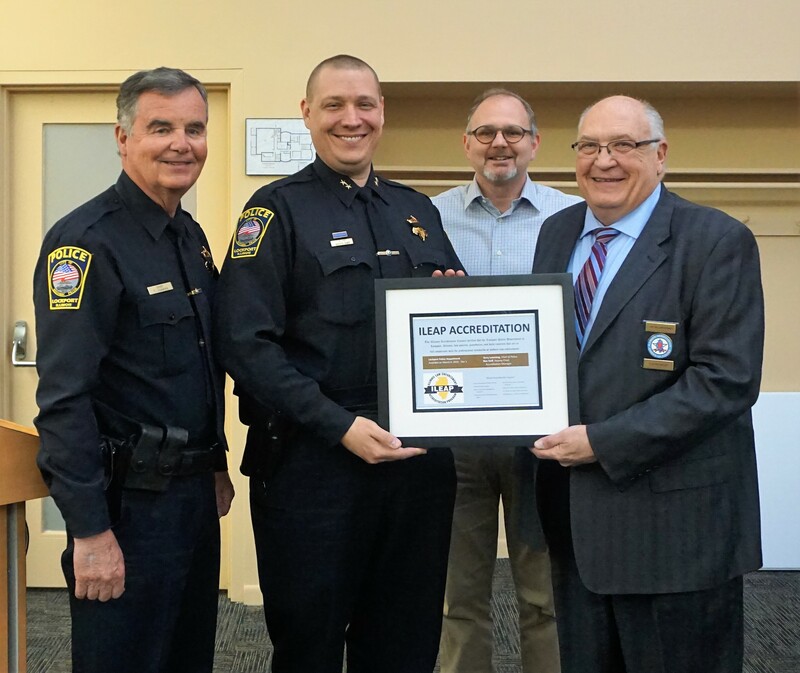 The Channahon Police Department was recognized on Monday, October 1, by ILACP Vice President Dean Stiegemeier (left) for achieving ILEAP reaccreditation. Representing the police department at the ceremony were Channahon Chief Shane Casey (right) and Sgt. Jon Jackubowski, Accreditation Manager. 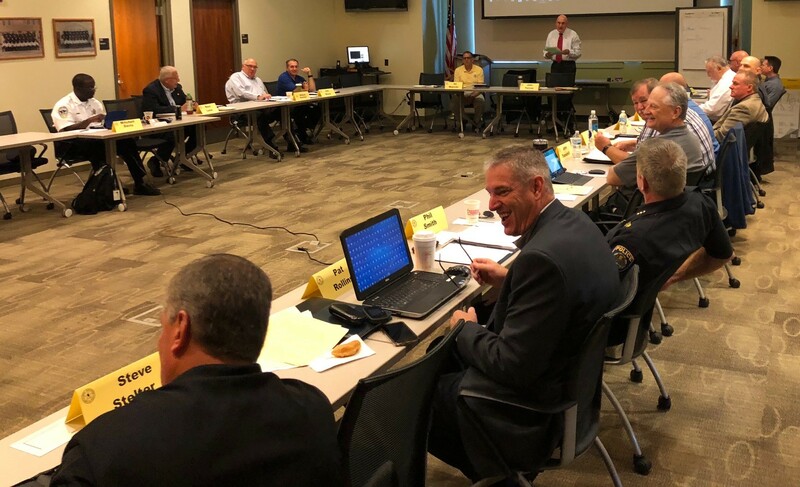 On Wednesday, September 26, the Board of Officers and Committee Chairs joined for the 2018 ILACP Annual Planning meeting at the Lemont Police Department in Lemont, IL. The group discussed a variety of topics which included ways to improve the Association in the year to come. Chief Maton, of the Lemont Police Department, chair of the Legislative Committee spearheaded the discussion on this year's legislative activity. The group also reviewed and updated ILACP committee goals and objectives for 2019. 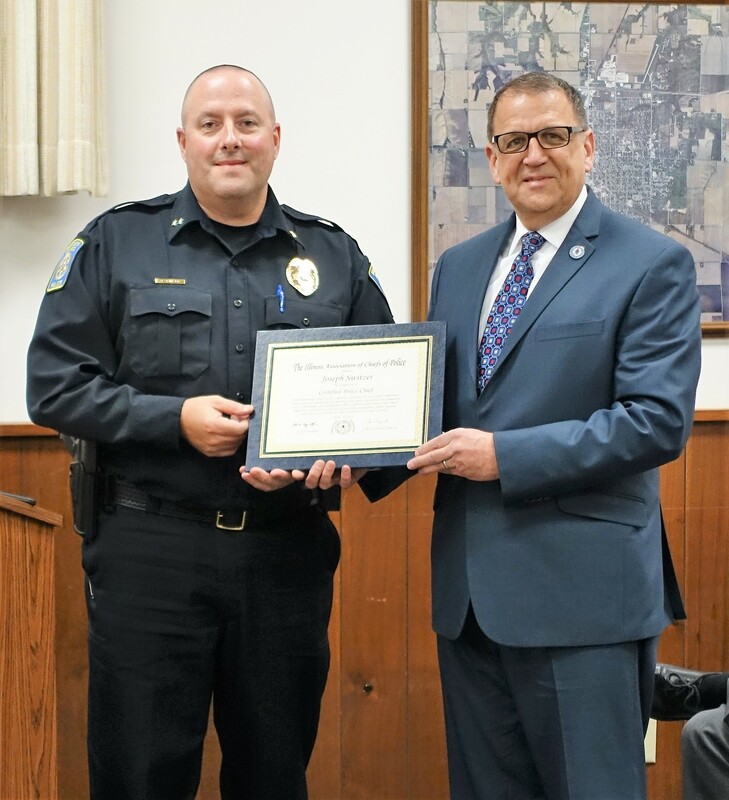 The Macomb Police Department received public recognition on Monday, August 27, 2018, for achieving Tier 2 in the Illinois Law Enforcement Accreditation Program (ILEAP). Accreditation is the process of comparing policies to best practices and having the department go through a peer review and audit. The goal is to reduce risk and liability while raising safety for the officers. The Macomb PD initially was accredited in 2012 and has since been reaccredited to the higher standards of Tier 2. 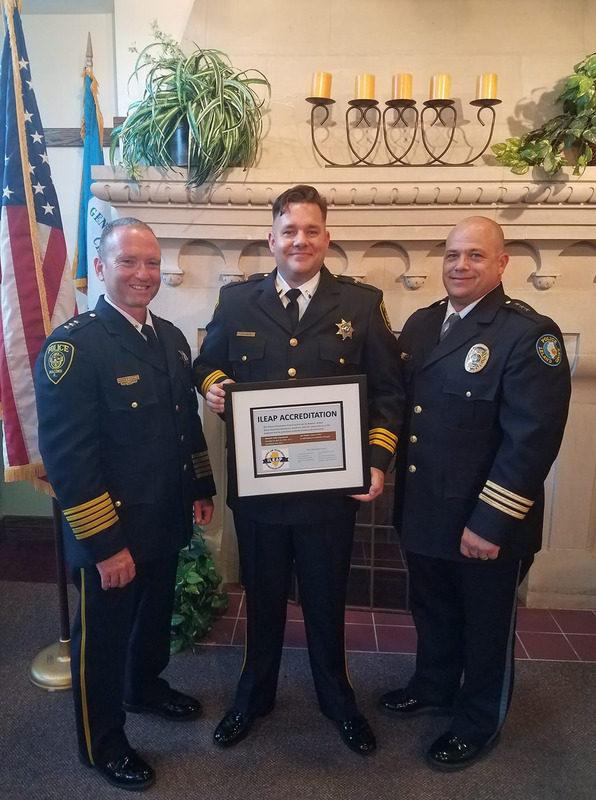 Pictured from left are Macomb Chief Curt Barker; Accreditation Manager, Lieutenant Jeff Hamer; and ILACP Vice resident at-Large Chief Dan Ryan, who made the presentation. Mt. 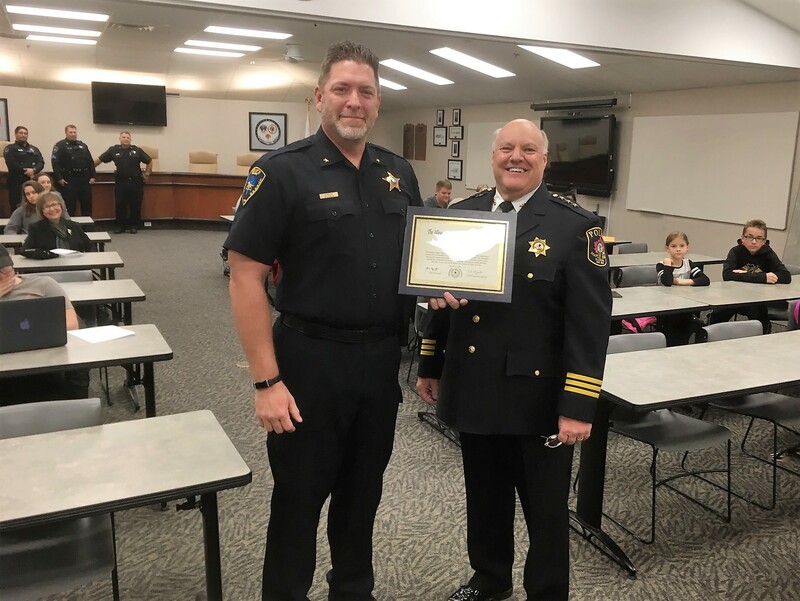 Prospect Chief John Koziol (left) receives congratulations from ILACP Vice President Steven Stelter after being recognized for achieving ILEAP accreditation. The presentation occurred during a recent Mt. Prospect Village Board meeting. 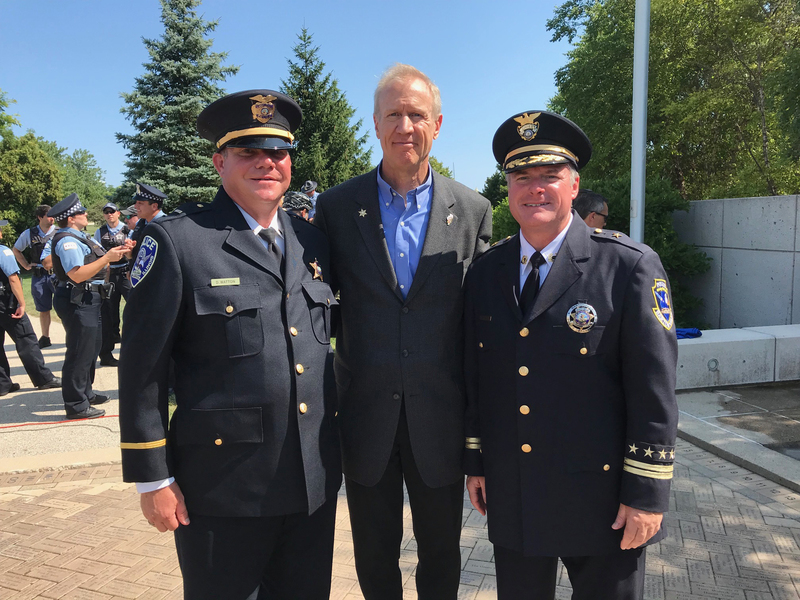 Governor Bruce Rauner signed SB 3023 on Wednesday, August 22, creating the Community-Law Enforcement Partnership for Deflection and Substance Use Disorder Treatment Act. It allows law enforcement to help individuals struggling with addiction in certain circumstances go to a treatment center instead of jail. The substance abuse deflection program is now Public Act 100-1025.The ILACP strongly supported this bill, with Mundelein Chief Eric Guenther and former Dixon Chief Danny Langloss (now Dixon’s city manager) testifying in Springfield in support of the bill. 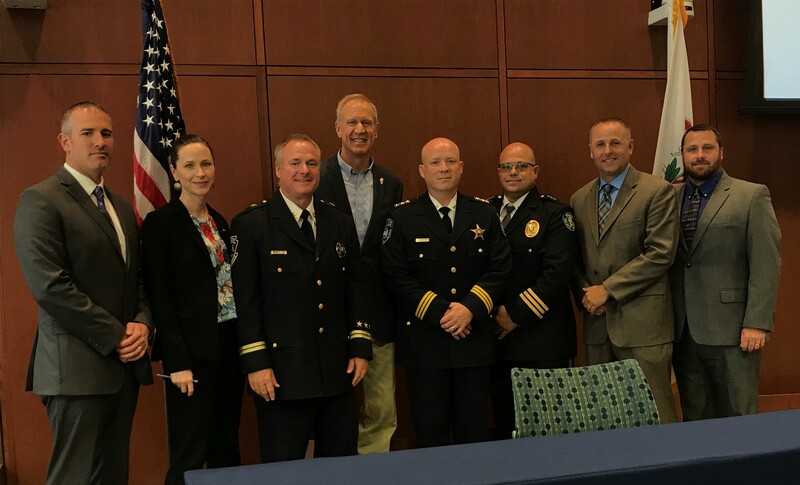 Shown (from left) are: Steven Howell, Jr., Dixon police chief; Laura Brookes, director of policy at Treatment Alternatives for Safe Communities; Chief Brian Fengel of Bartonville, ILACP president; Governor Rauner; Chief Guenther; Chief Dan Ryan of Leland Grove, ILACP vice president-at large; Langloss; and Detective Jeff Ragan, Dixon Police Department. Here is a story about how this deflection program works in Dixon. 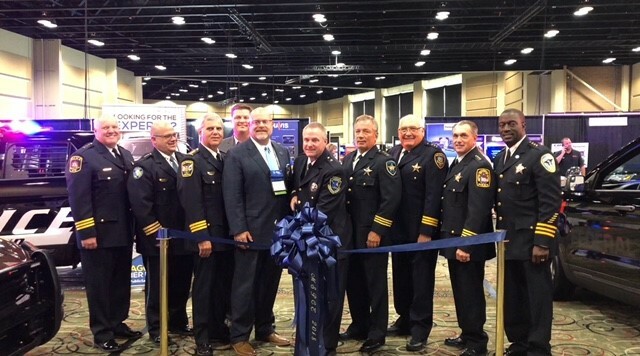 On August 14, the ILACP Board of Directors cut the ribbon at the entrance of the annual Expo, formally known as the Midwest Security and Police Conference/Expo at the Tinley Park Convention Center. 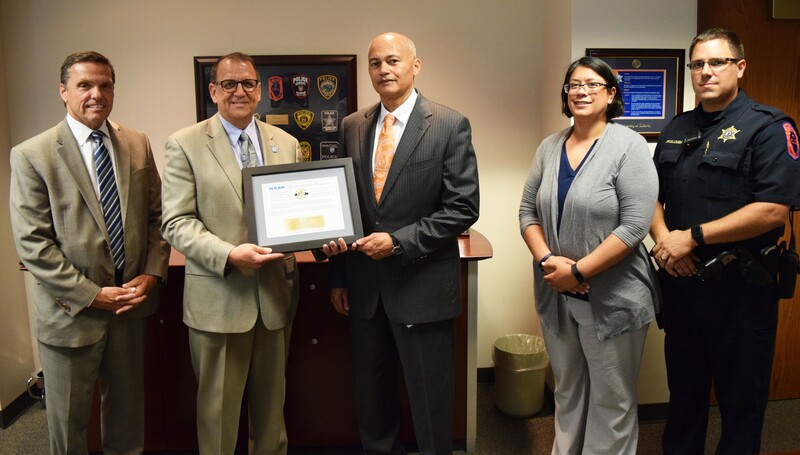 Chief Craig Stone, center, the new police chief at the University of Illinois at Urbana-Champaign, accepts a plaque on August 10, 2018, acknowledging re-accreditation of his department for Tier II in the Illinois Law Enforcement Accreditation Program (ILEAP). From left are UI Associate Chancellor Mike DeLorenzo, ILACP’s Ed Wojcicki, Chief Stone, Lt. Joan Fiesta and Lt. Joe McCullough. 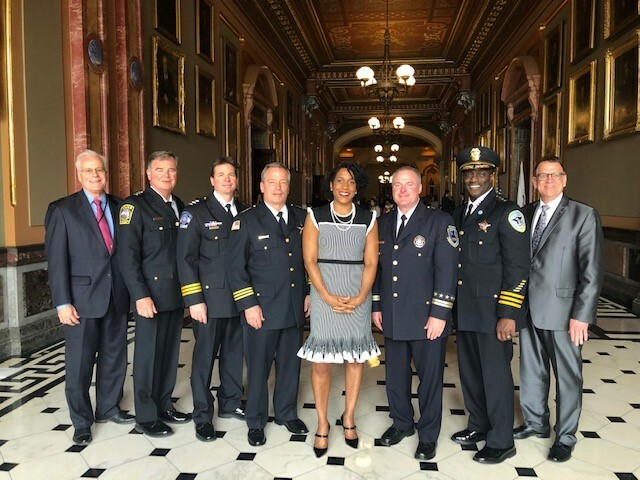 ILACP President Brian Fengel (right) was among those present Monday, July 30, 2018, in Chicago when Governor Rauner signed HB 5513, which creates a new Illinois Lottery scratch-off game from which proceeds will fund police memorials, support for the families of officers killed or severely injured in the line of duty, and protective vest replacements for officers. 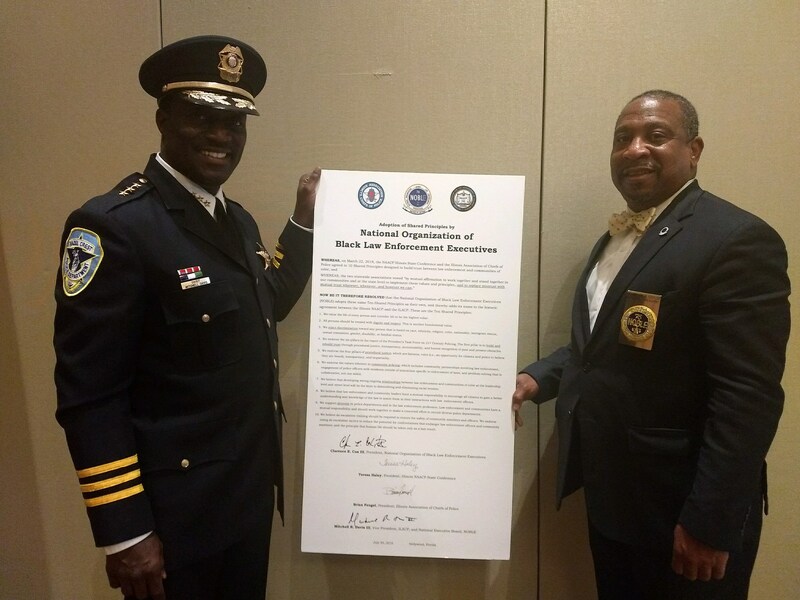 The National Organization of Black Law Enforcement Executives (NOBLE) became the first national organization to sign on to the 10 Shared priciples adopted by the ILACP and the NAACP. NOBLE signed on, on July 30, 2018 during its 42nd Annual Training Conference and Exhibition in Florida. Signing for the Illinois Chiefs, was 3rd Vice President Mitchell R. Davis, III of Hazel Crest, along with Clarence E. Cox, III, National President of NOBLE . On Friday, July 20th, the Special Olympics celebrated its 50th anniversary in Chicago. Pictured below are members from the Crystal Lake Police Department and CLPD Officer Ed Pluviose along with Chief Hoey (South Beloit PD) and ILACP 1st Vice President Chief Steve Stelter accepting the Flame of Hope as it arrived from Boston. 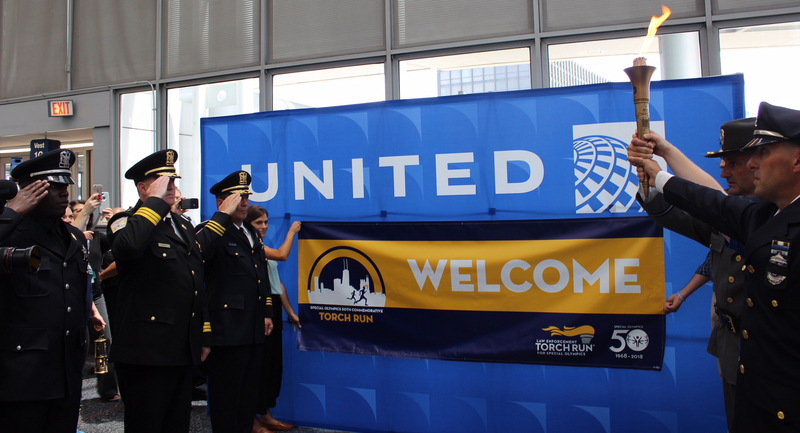 As part of this historic celebration, the Law Enforcement Torch Run will hosted a Commemorative Torch Run utilizing the Chicago Park District’s bike path that runs along Lake Michigan in downtown Chicago. The ILACP Traffic Safety Committee and Families Against Chronic Excessive Speeding (FACES4) understands the importance of tying together the legislative, educational and engineering component of speed awareness to the enforcement component of speed awareness that law enforcement agencies can bring to the table. On this one day campaign, Speed Awareness advocates joined at a press conference to continue building partnerships that aim to keep children and families safe while driving. Lt. Governor Evelyn Sanguinetti presented a proclamation from the governor’s office. A few months after the events took place in Ferguson, MO, the ILACP and the NAACP partnered to form a series of open discussions, or ‘World Cafes’, to address the mistrust between the community and members of law enforcement. In these ‘World Cafes’, chiefs of police meet with leaders from communities of color to specifically discuss “what most needs our attention moving forward”. On Wednesday, July 25, the fifth 'World Cafe' was held in the Chicagoland area where leaders discussed the “10 Shared Principles” and participated in an interactive workshop. A video from the event coming soon! ILACP President Brian Fengel (center) presents the ILEAP plaque of certification to Oak Brook Chief James R. Kruger, Jr. (left), and to Commander Ben Kadolph, Oak Brook accreditation manager, on July 10, 2018. 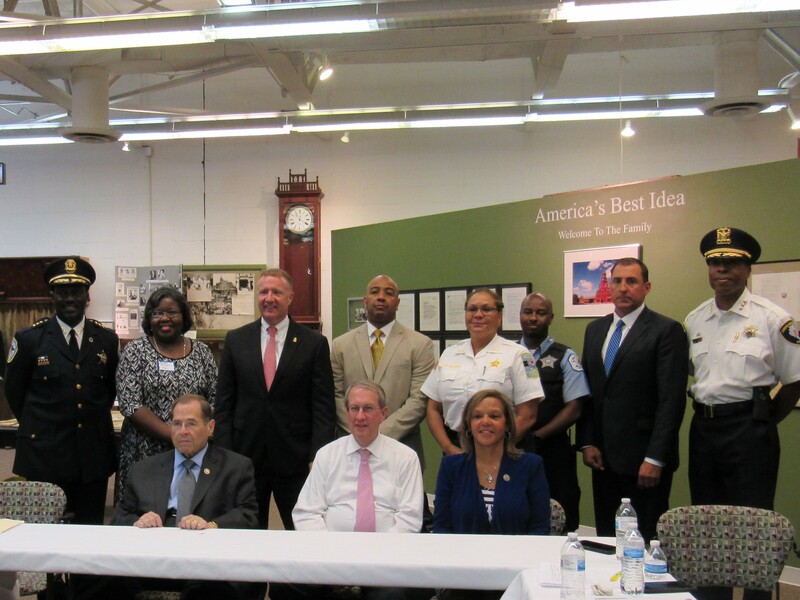 Vice President Chief Davis (far left) joined U.S. Rep. Robin Kelly at a Policing Strategies Working Group discussion, in Chicago on Monday, July 9. Two ILACP members of the Board of Officers were honored in Oakbrook Terrace on June 20, 2018, at the 22nd Salute to Those Who Make a Difference, a ceremony of the Illinois State Crime Commission. 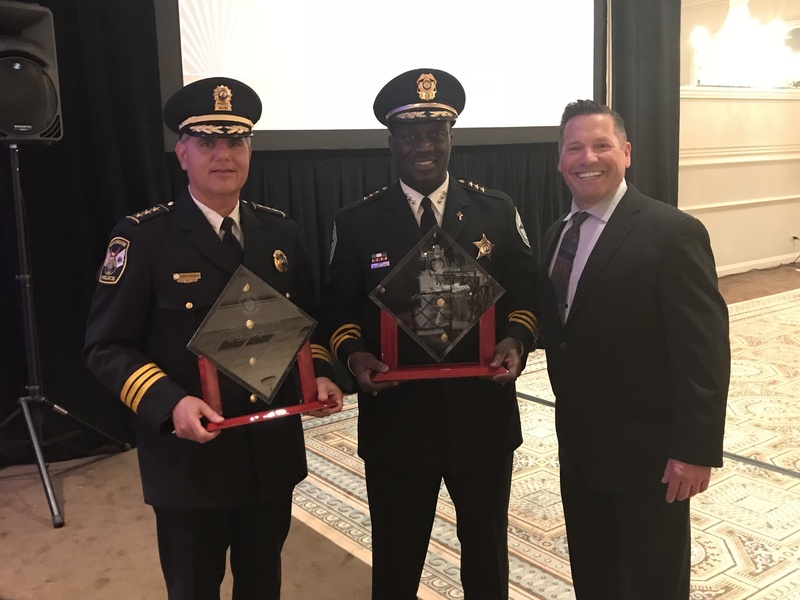 ILACP Past President James R. Kruger, Jr. (left), received the Award of Distinction in Law Enforcement, and 3rd Vice President Mitchell R. Davis III was named Police Chief of the Year. They pose with the evening's master of ceremonies, Ray Stevens of Chicago's WLS radio. On June 15, 2018, Mayor Herb Roach, along with O'Fallon Chief Eric Van Hook and local NAACP President Francine Nicholson signed a resolution affirming the adoption of the “Ten Shared Principles”, at the City Council Meeting in O'Fallon, Illinois. Chief Lou Jogmen, of Highland Park, received Police Chief Certification recognition from ILACP Vice President Bill Kushner on June 13, 2018. Vice President Dan Ryan, Metropolis Chief Harry Masse and Mayor Billy McDaniel honor Sgt. Cody Brown, with a 2017 Life Saving Award on June 13, 2018. Photo: From left: Vice President Ryan, Sgt. Cody Brown, Chief Masse and Mayor Billy McDaniel. 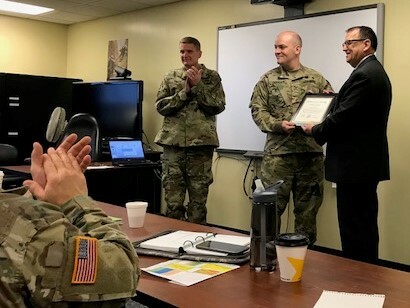 U.S. Army Major Matt Goodwin (above) receives his Certified Police Chief certificate November 29, 2017, in Springfield, in front a roomful of his Army colleagues and commander at the U.S. Army Reserve Training Center. He was eligible because of his "chief of police" title in the military. Executive Director Ed Wojcicki made the presentation. The Southern Illinois University Carbondale Department of Public Safety Achieved Tier II ILEAP Accreditation. Chief Benjamin Newman (right) and Corporal Molly Pyatt, accreditation manager, accepted the plaque from ILACP Executive Director Ed Wojcicki on March 19, 2018, during a ceremony on the Carbondale campus. Hamburger University in Oak Brook, Illinois. She was collaborating with Lake Zurich Chief Steve Husak, left; Captain Brian Daniell of the Union Pacific Railroad PD; Northlake Chief Norm Nissen; and Peoria Park District PD Chief Sylvester Bush. East Moline Police Chief John Reynolds and Pastor P. Wonder Harris of the Mt. Zion Missionary Baptist Church in East Moline at a meeting featuring police-minority partnerships around the state on November 17, 2017, at Hamburger University in Oak Brook, Illinois. 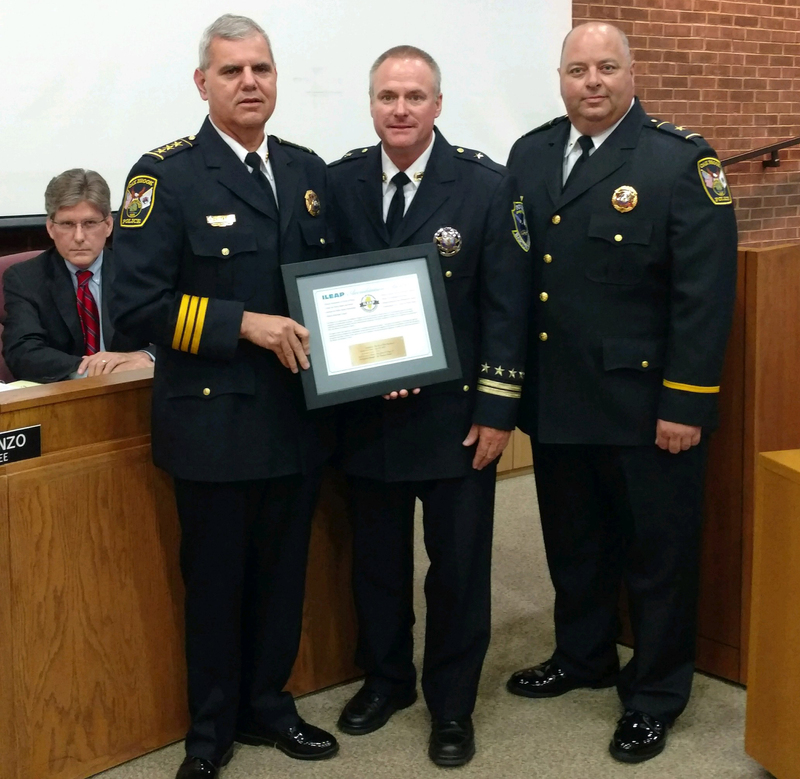 Monmouth Police Chief Joe Switzer is acknowledged at the Monmouth City Council meeting on November 6, 2017, for achieving Police Chief Certification by ILACP Executive Director Ed Wojcicki. 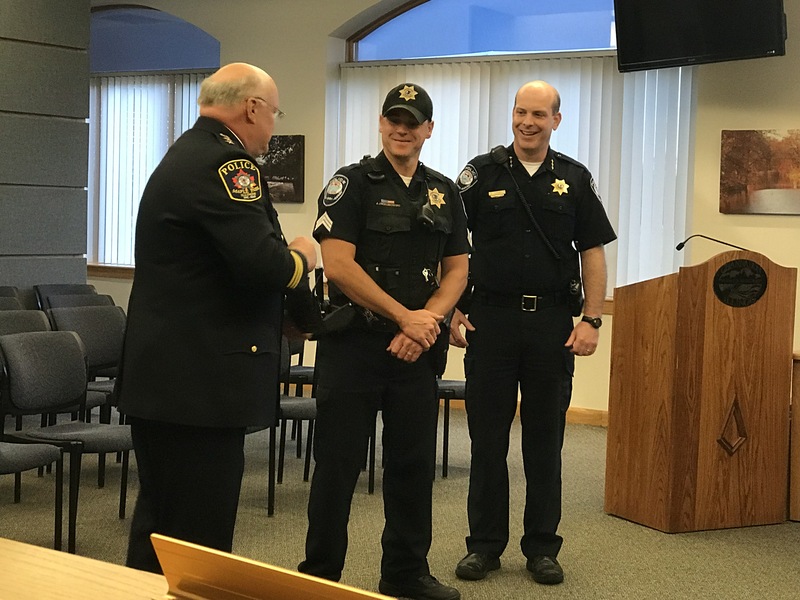 Officer Mark Dallas of the Dixon Police Department was named IACP Foundation's Officer of the Year after a heroic rescue at Dixon High School. On May 16, Dallas held the lives of all of Dixon High School students and staff in his hands after stopping a shooter inside the high School. When Dixon heard several shots ring out, he confronted the teen in the hallway. After the shooter fired at him several times, Dallas fired back hitting the former student in the shoulder. Last week and the national IACP conference in Orlando, Florida, the IACP Foundation recognized Dallas for his act of heroism naming him Officer of the Year.